Authorities were chasing a suspect near downtown Los Angeles on Wednesday, April 12, 2017. LOS ANGELES -- A road-rage suspect who led police on a wild high-speed chase through Los Angeles County on Wednesday spun out of control and was arrested. Officers with the San Gabriel Police Department and California Highway Patrol were in pursuit of the suspect, who was fleeing in a white Nissan Rouge with Colorado license plates. CHP said the suspect was involved in a road rage incident with San Gabriel police at about 11:30 a.m. The suspect, who hit speeds up to 110 mph, led authorities through downtown Los Angeles, South Los Angeles, Carson, Wilmington, Bellflower, and Cerritos. 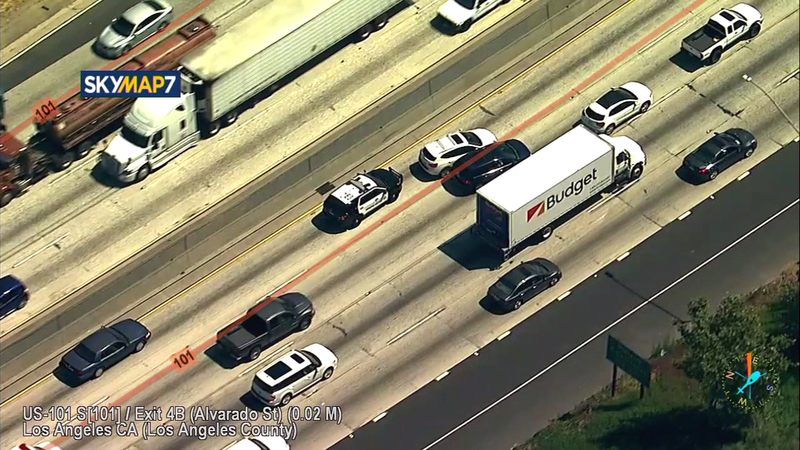 Police chased the suspect down the 110 Freeway until he exited near West Anaheim Street. The suspect hit speeds hit up to 80 mph on surface streets and was seen hitting several cars and driving on the wrong side of the road. The suspect got back on the 110 Freeway northbound and headed toward downtown Los Angeles again. While traveling down the 91 Freeway heading eastbound in Carson, the suspect was seen intentionally hitting a patrol cruiser. While attempting to flee police, the suspect's SUV spun out of control and crashed down an embankment in Cerritos. The suspect, who was acting erratically, attempted to flee on foot but was taken into custody shortly after.